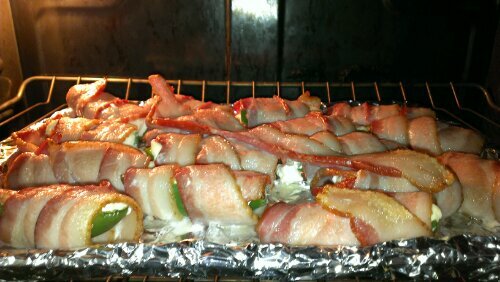 Jalapeno poppers wrapped on bacon. Its really quite simple and oh so yummy. My sister in law (of whom I’ll post pics of later) made these little bits of spicy heaven for us while we were visiting in Denver. Its very easy. You simply slice jalapeno peppers lengthwise, scoop out the seeds, stuff with cream cheese mixed with garlic powder, wrap in bacon (I use a whole slice) and then bake at 375° for about 30 minutes. If the bacon isn’t crispy enough just turn on the broiler for a few….but don’t burn them! The jalapenos lose some heat after they are cooked, and the bacon and cream cheese temper it some more. So eat away, enjoy, and save some for the rest of the family! !